When the “Mile 2” version of Appleton’s four-day Mile of Music festival rolls into town Aug. 7, Lawrence University’s fingerprints will be ever present. The follow-up to 2013’s inaugural original hand-crafted artisan music festival builds on the success of its debut with more than 200 artists — bands and solo performers — delivering more than 600 live performances Aug. 7-10 at 60 venues along College Avenue and the Fox River. For the second year in a row, the Lawrence Memorial Chapel will host several of the festival’s headline acts, including folk/bluegrass guitar picker Christopher Gold and Nashville singer/songwriter Adriel Denae. Performances also will be held in Lawrence’s Stansbury Theatre and the Viking Room in Memorial Hall. The Milk Carton Kids, which had been slated for a Friday night show at the Lawrence Memorial Chapel have had to cancel. However, in their place at 10:25 p.m., Mile of Music organizers have formed an outlaw-themed performance hosted by festival co-founder Cory Chisel. Joining Chisel for the roundtable performance are new additions Langhorne Slim and Ruby Amanfu. Beyond merely hosting events, numerous artists whose musical roots can be traced to Lawrence will be among the festival’s performers. And an extensive series of hands-on, participatory music education events, featuring more than 30 workshops and demonstrations, will be led by 1987 Lawrence graduate Leila Ramagopal Pertl, the festival’s music education curator. With the support of the Community Foundation for the Fox Valley Region, Pertl has assembled an expert team of 10 area music teachers and music education students, all with ties to Lawrence, who will conduct sessions ranging from Balinese gamelan to Brazilian samba, each focused on releasing each participant’s inner musician. The Involuntary String Band will be one of eight artists with ties to Lawrence that will be performing during the second Mile of Music festival. 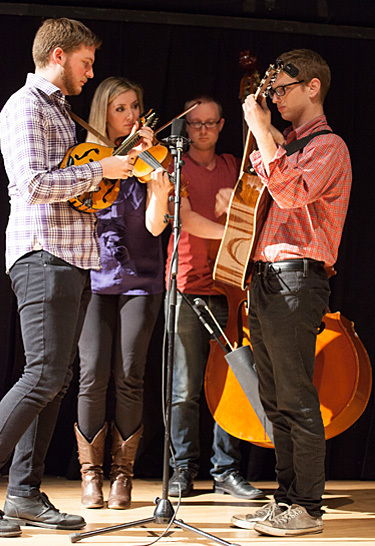 • The four-member Involuntary String Band, features Martha McDonnell ’14 on fiddle, Davey Harrison ’13 on mandolin, Ilan Blanck ’16 on guitar and banjo and Nick Allen ’14 on bass. McDonnell just finished a 38-show run as a hand-selected member of the pit orchestra for the world premiere run of Sting’s new musical “The Last Ship,” which opened June 10 at Chicago’s Bank of America Theatre. Saturday, Aug. 9, 4:30-5:20 p.m., X-TRA 920 – VIP Priority; Saturday, Aug. 9, 7:40-8:30 p.m., Deja Vu – VIP Priority. • Fatbook, a former student band that won two DownBeat “best college/blues/pop/rock group” awards in 2009 and ’10. Currently based in Chicago, the band features three Lawrence graduates: founder Harjinder Singh ’11, guitar/lead vocals; Evan Jacobson ’08, trombone; and Reed Flygt ’08, drums. Friday, Aug. 8, 2:40-3:30 p.m., Deja Vu – VIP Priority; Friday Aug. 8, 6:50-7:40 p.m., Luna Lounge – VIP Priority. • Jana Nyberg Group, a five-member jazz/pop/soul band out of Minneapolis/St. Paul managed by Adam Meckler ’07, who also plays trumpet in the group. Friday, Aug. 8, 1:30-2:20 p.m., Deja Vu – VIP Priority; Saturday, Aug. 9, 4:40 -5:30 p.m., Skyline Comedy/Music Club – VIP Priority. • Bright Kind, a four-member band featuring Alex Bunke ’09 on drums and Eric Klosterman ’10 on keyboards. Their self-titled first album was just released in late July. Friday, Aug. 8, 5:40-6:30 p.m., Luna Lounge – VIP Priority. • Oshkosh-based singer/songwriter Ross Catterton ’08, a multi-instrument musician who plays saxophone, guitar, piano and drums. Saturday, Aug. 9, 4-4:50 p.m., Frank’s Pizza Palace; Sunday, Aug. 10, 2:30-3:20 p.m., McGuinness Irish Pub. • Fresh off a two-week tour of New England and Toronto, Holy Sheboygan! returns to Mile of Music. The seven-piece folk/trash band features an all-Lawrence line-up: Julia Blair ’11, viola/accordion/lead vocals; Cameron Carrus ’13, bass; Ben DeCorsey ’10, guitar/mandolin; Jeff Edenberg ’10 horn/glockenspiel/recorder/saw; Cary Foxx ’12, bass clarinet/tenor saxophone; Rachel Graber ’13, “recycled percussion” (tire rim/chip bucket/keg); and Liam O’Brien ’10, guitar/lead vocals. Saturday, Aug. 9, 1:50-2:40 p.m., The Bar – VIP Priority. “The music education team has created all sorts of opportunities for everybody to transcend the role of passive listener and embrace the role of active music maker. • The six-member, all Lawrence student/alumni Porky’s Groove Machine makes its Mile of Music debut. The self-described nerd fund band features: Matthew Lowe, ’14 trombone/vocals; Casey Frensz, ’14, saxophone/vocals; Marshall Yoes, ’15, trumpet/vocals; Nick Allen, ’14 bass; Ilan Blanck ’16, guitar; and Patrick Marschke, ‘13, drums. Saturday, Aug. 9, 6-6:50 p.m., Lawrence Viking Room. • The Appleton-based, bro-pop quartet The Crowe Brothers features 2011 Lawrence graduate Jake Crowe, guitar/bass/saxophone/vocals, and his three younger brothers: Luke, guitar/vocals; Ryley, vocals/drums; and Antone, guitar/bass/vocals. Thursday, Aug. 7, 7:50-8:40 p.m., Emmett’s – VIP Priority. • Kiddy/Wompus, a three-member gypsy, roadhouse blues band out of Marquette, Mich., is led by 2014 Lawrence graduate Alexis Mahler, violin/cello/vocals. Saturday, Aug. 9, 12-12:50 p.m., Emmett’s – VIP Priority. Lawrence’s connection with the festival includes 2008 Lawrence graduate Nathan Litt, who has the Herculean task of orchestrating the festival as project coordinator with Willems Marketing, one of the co-organizers of Mile of Music. “Once again, Lawrence has stepped up as a key partner,” said Litt. “There is a good representation of Lawrence-connected artists performing during the festival. We’ll take advantage of several university venues and the university’s collaboration on the music education aspect is something that really sets Mile of Music apart from many other festivals across the country. I can’t wait to see how our partnership with Lawrence continues to evolve. There is a lot of potential for the future and that’s a good thing. Litt says the festival’s lack of household names should not be confused for lack of talent. Read more about this year’s Mile of Music festival.